I was helping a couple of good friends with a painting project when I discovered a new rule of thumb for consumer purchases: Don't buy ladders on clearance. 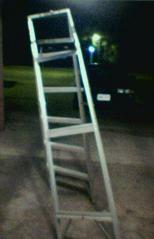 The photos below illustrate what happens when a $25 ladder, even when used properly, decides to give up the ghost. I was on the second rung, so no permanent injury was sustained, but the affair left a brilliant streak of blue-gray paint on my friend's yard. Lest you make any jokes about my weight, I tip the scales at a beefy 174 lbs. 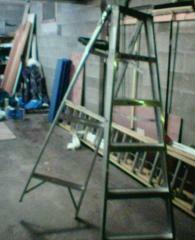 The saddest part may very well be that the man who purchased the ladder is an insurance adjuster. Perhaps I should've thought better when I read the "Clearance" sale sticker still affixed to the top rung.